These days many people are moving towards dental implants instead of removable dentures. This is mainly because of the comfort what they provide and it’s various benefits over the traditional ones. If you are feeling embarrassed because of spaces in between teeth then dental implant is the best solution. If you go for dental implant the key benefit is you need not to replace tooth once in a while with new one. There are many cases like you feel difficulty in chewing or eating meat because of the spaces and for all such types of problems placing implants is the only solution. The dental implant make you feel comfortable and look attractive then before. After the implant placement you can smile with confidence also. Most of the people go for dental implants just to make the look beautiful and more esthetic. The problem with fixed or removable dentures is they won’t give proper look and some food residues will cover the lower portion of removable teeth. Mouth Trauma, root canal failure, tooth decay, excessive wear and tear and periodonitis are some of the major reasons are tooth loss. Because of tooth loss there are chances of changing the eating habits and hence may lead to malnutrition. Some of the benefits of dental implants are discussed here. 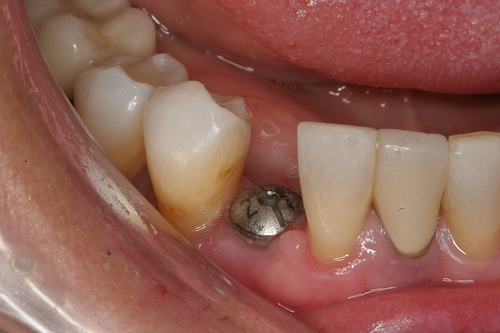 In most of the times dental implants give natural look and even you wont feel that you teeth are implanted. They change the way you look physically. Dental implants are proper implants that fit to your mouth properly and lasts for long duration of times and sometimes even for decades. It is one of the basic advantages of going for dental implants instead of regular ones. They are very strong and does not brake even in case of accidents. The best part of dental implantation is that you can replace with the type of teeth you want. You can also get different varieties of teeth like silver, gold and other costly materials from which teeth can be built. It effectively solves the tooth loss problem by replacing with the right tooth. It is an artificial approach to replace existing tooth with new tooth. Technically dental implant is also called with the name prosthetic dentistry. It provides support for complete teeth structure. Dental implant makes your tooth work properly. Even though there are additional methods and therapies introduced to overcome tooth loss but none of them are permanent solution and they are not effective as implants. All the dental implants are comfortable and durable. They support bridges and also helpful in removing the partial denture. With dental implant it is possible to replace single or multiple tooth without leaving a single gap between them. Even though they cost bit more than traditional methods they are effective and work faster. They are easy to implant and maintain. Any type of dental implantation can be done in couple of hours and you are allowed to anything after the surgery. They require less maintenance hence no need to worry about eating any thing you like. I have earlier compared the Dentures and Dental implants and each has its own advantages and disadvantages. What is the importance of age and got prices for the implant process?